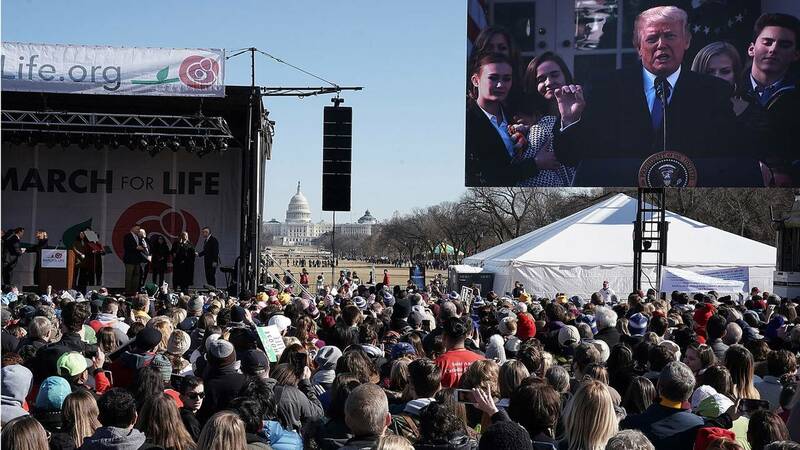 Pro-life activists watch President Donald Trump give remarks from the Rose Garden during a rally before the 2018 March for Life in Washington, D.C.
WASHINGTON (CNN) - An anti-abortion rights bill passed in the House Friday morning ahead of the March for Life, the biggest yearly event for anti-abortion activists in Washington. If the doctor fails to provide medical care, they could face a criminal fine, up to five years in prison, or both. It's not clear whether such a bill would advance in the Senate, where it would likely require at least 60 votes to break a filibuster. The bill was first introduced by then-Rep. Trent Franks, who resigned in December after allegations of sexual harassment. The legislation was then reintroduced by Rep. Marsha Blackburn, R-Tennessee. House Speaker Paul Ryan addressed attendees at the March for Life on Wednesday, appearing alongside Reps. Jaime Herrera Beutler, R-Washington, Dan Lipinski, D-Illinois, and Chris Smith, R-New Jersey. "Just a few minutes ago, today, we passed the Born-Alive Abortion Survivors Protection Act. It protects the life of those babies who suffer from failed abortions," he told the attendees. "But most importantly, like the March for Life, we are striving to do this without judgment in our hearts but with compassion and love for all the victims." President Donald Trump also praised House Republicans for passing the bill while addressing attendees in a speech from the Rose Garden. "I call upon the Senate to pass this important law and send it to my desk for signing," Trump said. Abortion rights activists plan to counter-protest in Washington with a rally at the Supreme Court on Friday, as well as the Women's March on Trump's one-year inauguration anniversary on Saturday. The debate on abortion in Washington comes amid a potential federal government shutdown, after House Republicans passed the spending bill out of their chamber Thursday night. The bill's future in the Senate is dicey after more than a dozen Democrats already announced they'd vote against it.